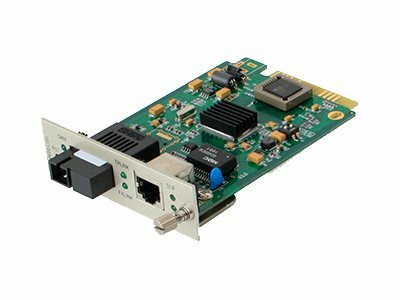 This is a media converter card that converts a 10/100Base-TX(RJ-45) to 100Base-BXD(SC) via a 1310nmTX/1550nmRX single-mode fiber (SMF) SC connector, which allows distance reach up to 60km. It provides a cost effective conversion from 10/100Base-TX(RJ-45) to 100Base-BXD fiber, while extending the network reach beyond the 100m reach limitation of copper. This device can be managed if used in our managed rack system or unmanaged with our unmanaged rack system or standalone chassis enclosure. The media converters are 100% compliant for all of the networking needs. Now you have a cost effective solution to your network upgrade needs.